A Jaw Horse is on its way! Was speaking with the manufacturers of the Jaw Horse yesterday, and apparently there is one on the high seas at the moment, floating its way down under so I can review it and put it through its paces! Given that it is (literally) on the slow boat from China, it will take a couple of weeks or so so arrive in Oz, (and add whatever fudge factor to that), then clear customs, be unpacked etc etc, so some time in the next month. If at all possible, I would like to aim to have a review of it out before Christmas (yeah – isn’t that scary – only a month of so away already), but there are too many factors that are out of my control to be able to say that with any certainty. However, it does mean that Stu’s Shed will be able to give it’s independent opinion on the product, and given that I have had (3 or 4) Superjaws in my shed for years now…… (no, I don’t use them up and need another – I actually have about 3 Superjaws out there – awesome tool) Given that the Jaw Horse is fundamentally the same tool, and was designed by the same Australian engineers that came up with it, I have high expectations that the Jaw Horse will be at least their equal. Reported on the Australian Woodwork Forums, Bunnings are actually selling a handsaw with attached laser. Not one to knock something before I’ve even seen it….b u t…….if things are getting that bad that you need a laser on a handsaw, it might be worth considering a trip to Ikea for your furniture – doesn’t sound like a shed is the safest place for you….. 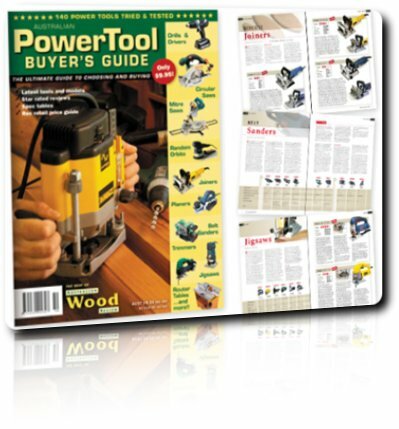 The Australian Wood Review is bringing out the Power Tool Buyers Guide, expected in shops around the 31st of July. There are around 110 tools reviewed in it, with brands including AEG, Archer, Bosch, Carba-Tec, CMT, DeWalt, Festool, GMC, Hitachi, Makita, Metabo, Professional Woodworkers Supplies, Ryobi and Triton. (No, I don’t have any reviews in this one, next time perhaps. Actually, speaking of which, keep an eye out for the next issue of Australian Wood Review, as my Pro Drill Press Table review will be in there 🙂 ). Anyway, back to the Buyers Guide, it is going to be $9.95, and you can have a pre-ordered copy delivered directly if you wish for $2 p/h. Contact Australian Wood Review on 07 3806 2288 if you want to pre-order your own copy. Fascinating what can be found in overseas magazines, and on their websites! This is a brand new release from Rockwell tools, and for those who know the Superjaws will find an amazing similarity in appearance, specifications, and function (and fwiw, design engineers)! Rockwell Jawhorse HD RK9000 Workbench System – As Seen on TV! As seen on TV, this heavy-duty hands-free clamp not only secures workpieces with a rock-solid grip, its wide stable frame instantly provides a go-anywhere workstation to make cuts, drill holes, and more. Hold and cut doors, two-by-fours, two-by-twelves, and odd-shaped objects. 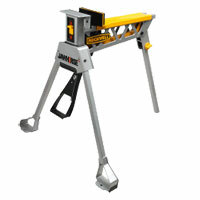 Mount miter saws, tile saws, grinders and other tools to wood panels and use the Jawhorse as a sturdy stand. Clamp in a vertical support piece and install crown molding all by yourself. Do it all and more with this incredibly versatile tool that also folds up for simple storage and transportation. I always try to provide participants on one of my courses with as good a value for money as I can, and one of those things is to at least be one place that people can actually get to see, and use some of the range of new Triton tools. This included the brand-new (yet-to-be-released) 235mm Triton saw which I will be reviewing shortly. Been very busy the last few days, so a bit quiet on the posting front! Had another good course on the weekend, with lots of sawdust made. Tried my hand at an end-grain chopping board – a simple project but one I’d not gotten around to doing. Nothing elaborate (I don’t exactly get much time to make things while running a course! ), but it was still an interesting 5 minute experiement. With the overall demise of the Triton demonstrator program (not sure it’s long-term outlook, but certainly it is in stasis for the forseeable future), I’ve decommissioned my “Triton Demonstrator Trailer”, as well as the tools therein. The trailer is nothing more than one with a cage and a cover, but up until now it wasn’t useable for anything else being full of tools. When a demonstration was on, all I had to do was throw it on the back of the car and go. So I’ve now unloaded it completely, and have placed the tools into a storage shed (with some disassembly), and a coating of WD40. They will get dragged out as required for any applicable videos etc for this site, but I’m seeing really as the end of my Triton Demonstrator era. It is interesting looking at the shed colour scheme – at one stage it had a strong blue presence – lots of GMC tools (lathe, thicknesser, saw, sanders, drills etc), and that slowly became ‘infected’ by an orange bug that was carried into the workshop by one of the early additions, and the workshop took on a full-blown orange hue. That is changing again, as each tool gets upgraded to a more serious version. The transition will be over a long period of time, and I can’t currently imagine a time that there are not still some GMC, and some Triton tools out there, but I wonder if the involvement level of a person in the pursuit of the hobby could be graphed on a colour chart?